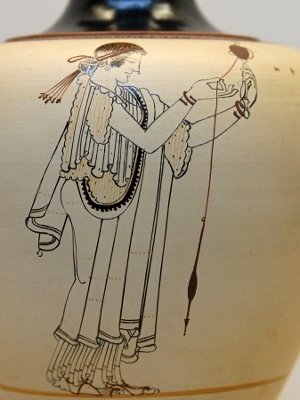 Spinning fiber into yarn is such an ancient art that its origins are lost in the mists of time. That’s not an exaggeration; the oldest recovered artifacts made with ‘yarn’ are string skirts that date up to 20,000 years ago. At that time you would have made plant and animal fibers into yarn by rolling it between your palms or down your thigh, adding more fiber as you ran out. Once you had a good length of ‘string’ you tied it to a rock and twirled it until the whole thing was twisted enough to stay together. By 5,000 BC spindles began to appear. This is estimated to be about 1,000 years before the invention of the wheel, which gives you some idea of how ancient they are. The first spindles were nothing more than straight sticks to wind the yarn onto, usually with a notch in the top to secure the end. Later versions included hooks of bone instead, but with either of these the spindle had to be rolled along the thigh or manually whirled some other way until it was full enough to spin steadily. Enter the whorl! A whorl is a weighted disk was added to the bottom of the spindle to make it spin longer and more steadily. Whorls were usually disks of wood, stone, clay, or metal with a hole in the middle. They allowed the spinner to slowly ‘drop’ the spindle as it was spinning – hence the name ‘drop spindle.’ This was an important advancement because it allowed spinners to create longer strands before stopping to wind the yarn. Soon, spinning looked like something that any handspinner today would instantly recognize, as evidenced by the 2500 year old artwork above. 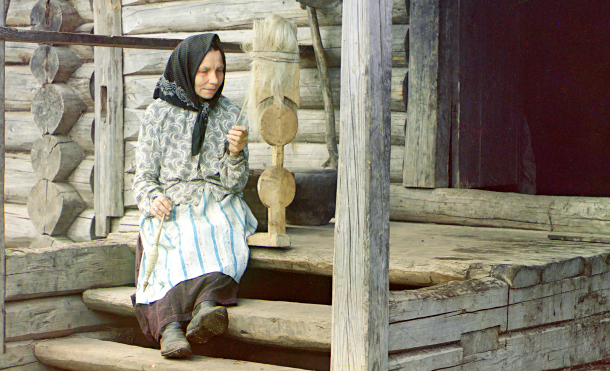 While simple and immensely useful, spindles were a limited tool for spinning. 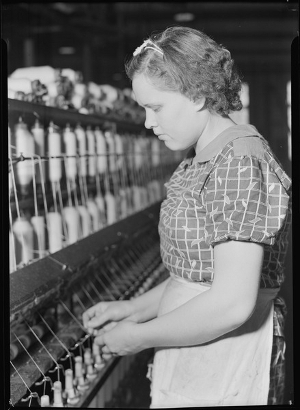 Creating enough fiber to make clothes was slow and extremely time-consuming, and required many people to complete. It was the invention of the spinning wheel that revolutionized the manufacture of yarn and textiles, and in fact, the world. No one knows for certain where or when the first spinning wheels were made. Some believe they originated in India between 500 and 1000 AD. These early spinning wheels – which are still in use today – are called Charkha wheels. Instead of a wheel with a rim, Charkha wheels were composed of spokes with holes in the ends. A string was run through the holes, connecting the spokes in a zigzag and supporting the drive band. The drive band was connected to a spindle on it’s side, and powered by a hand crank. The painting at right, created some time between 960 and 1127 AD, shows a similar spinning wheel design from China. It had long bamboo spokes and was used for spinning silk. More familiar versions with rims make their first documented appearance in the windows of French cathedrals dating to the 13th century, although as they are illustrated it appears they were used more as giant bobbins for winding yarn than as tools for spinning it. Soon, though, the use of spinning wheels with rims to spin fiber was developed and spread, and by the 14th century a manuscript illustrated in Britain showed women spinning with them. 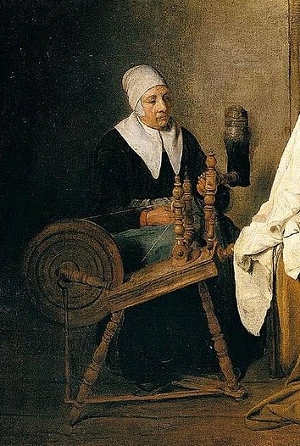 There were still improvements to be made; flyer wheels allowing spun thread to be automatically wound onto a bobbin were not documented until about 1475, and foot treadles that freed the hands from cranking were not developed until later yet (although estimated dates for this innovation vary wildly, from the 15th to the 17th century). 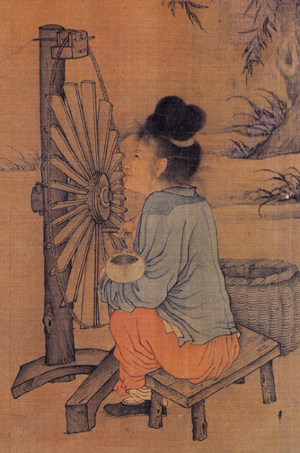 The invention of the spinning wheel sped the production of fiber for cloth anywhere from 10 to 100 times. Suddenly much more cloth could be produced, and it created some unintended side effects. For example, the sudden availability of linen rags led to a boom in the paper industry. Before paper was easily obtainable for making books, they would have been written on parchment: one Bible would have required the skins of two or three hundred sheep. With the availability of cheaper paper, the development of Gutenburg’s printing press made sense – making the invention of the spinning wheel indirectly responsibly for the rise of printed media, the spread of education and the advent of democracy. Not bad, right? The introduction of the spinning wheel along with advancements in weaving looms created another boom as well – this time in sails for ships. Prior to these inventions fiber for sails had to be laboriously spun with a spindle. Just imagine trying to spin enough for even one of these sails! 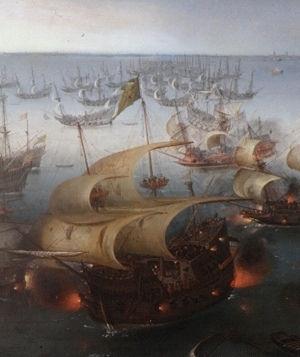 With new, quicker methods available, there was an explosion in the number and size of sailing vessels on the seas available for exploration, trade, and warfare. This was hardly the end of the story for yarn, of course. In the 1760s rapid innovations in technology such as the water frame, spinning jenny, and spinning mule enabled the establishment of the first textile mills. By the 1780s steam power allowed these mills to be semi-automated. In the years that followed, refinements were made that allowed more and more to be spun until by 1830 self acting “mules” with 1300 spindles apiece were at work. It is at about this time that ring frames for spinning were also developed, a technique that continues to be used today. Most commercial fiber spun today, however, is manufactured via a method called ‘open end spinning,’ which was developed in 1963. The principle is similar to the drum of a dryer; if you could fill your dryer with sheets and open it while it was running to pull one out, the sheet would twist as you pulled it. Open end spinning is much faster and less labor intensive than ring spinning, allowing yarn to be produced much more cheaply, but it produces fiber that is fuzzier and wears poorly when compared to ring spun fiber. 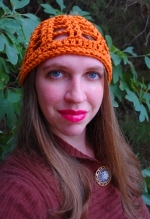 Fortunately crocheters don’t have to rely solely on mass produced commercial sources for their yarn. Today small independent or artisan suppliers are only a click away on the internet, and if you’re in the mood you can make your own on a spinning wheel – or even the ancient drop spindle. Article © Melissa Mall. All rights reserved. I very much enjoyed your article.The interweaving of fiber, spinning,cloth, and the advancement of civilization fascinates me. I had not considered how the availability of cheaper cloth led to the availability of cheaper books, and all that came from that! The world owes a vast debt to the fiber artists throughout the ages.